Iowa Birth Activists: Why a rally? Perhaps you’ve heard something similar, a bit of confusion about what this rally is really all about and what it is intended to accomplish. 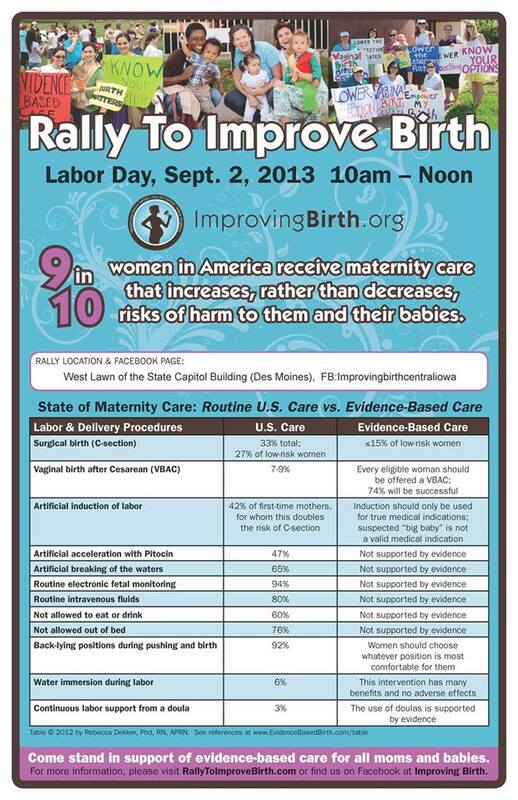 The Improving Birth Labor Day Rally is a symbol. It’s a national (global) display of unity. It’s a moment in time when we all stand together to show that although sometimes we feel like we are few (in our communities) we truly are many. There are many who know how important the issue of how we conduct birth in our country is. There are many who want to see this change. There are many who know that we can do so much better. It’s a rally. Simply put. Just like the high school homecoming football game pep rally or the rally cry for battle. It is simply that – a rally. It is a gathering of community for a single purpose – to put their energy towards the mission ahead. The game. The battle. The rally is NOT the game, it’s the build-up to the game. A rally is a time to feel the energy of the community surging toward the same vision – winning. We recognize that “the game” is different in every community. They global rally is a stage to come together on the issues that we are all collectively battling. It’s a time to unify and build relationships and networks; to harness the energy of all those collective supporters. The point is to use this energy to go forward in your communities and play the game! The rally is not the game. I am joining a rally in my local community because I believe that respect, humanity, and evidence-based care should be the norm, not the exception when it comes to childbirth. I am rallying to improve birth because change for tomorrow starts with me today. Let your voice be heard. Rally!